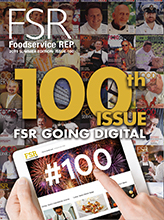 Visit www.foodservicerep.com.au to check out the latest issue! As we’re celebrating our 100th edition this issue, it seems an opportune time to look back over the years and see how we’ve changed along with the foodservice sector. You’ll find that story along with a selection of past covers on page 4 – plus exciting news about the next step in Foodservice Rep’s evolution. Yes, from next issue the new magazine is going fully digital in an innovative new webmag format which you can view online at www.foodservicerep.com.au. Our cover story this issue is an interview with internationally acclaimed pastry and dessert chef Christy Tania, whose culinary ambitions led her away from IBM’s Global Business Services Management team in Singapore where she was working as a project manager at 23. And with the festive season fast approaching, this issue we focus on functions – looking at the challenges of preparing a function menu in today’s market and checking out the classy club food being served at Club Toukley RSL. We start off this issue with an interview with Tony Twitchett, Executive Chef at Melbourne ‘destination restaurant’ Taxi Kitchen. We also report on the 20th anniversary Proud to Be a Chef mentoring program. Entries for which opened at the beginning of August. Apprentice chefs have until 31st October to try for a place in this truly life-changing experience. And with burgers such a hit among Aussie diners, we look at what other protein options are out there apart from the obvious choice of beef. In this edition we interview Robert Green, Executive Manager of Operations at Revesby Workers, one of Sydney’s biggest and highest profile clubs – an icon of the local community which has built an enviable reputation not only for the breadth of its services but also the quality of its dining standards. We also look at readymade soups, sauces and gravies; examine the contemporary trends in seafood; and celebrate the 100th birthday of iconic Aussie poultry products supplier Ingham’s. In this edition we find out Gary Johnson’s recipe for success. For the Spirit Hotels National Food Manager and Group Executive Chef, it’s all about excellent execution every time. We also take a look at the challenge of preparing and serving gluten and allergen free food as well as breakfast trends, what makes and breaks a burger and how pizzas are rising to the top of pub menus. Special healthcare focus: My Food Choice transforms patient meal deliveries and pre-moulded minced and pureed foods receive a new, and more appetising, lease on life. Proud to be a Chef is heating up for its 19th iteration in 2018. Hear all about how the preparations are going for Australia’s number one foodservice mentoring program. In this issue we also take a special look at festive season functions. Our functions focus will take you from The Terrace of Melbourne’s Royal Botanical Gardens, to the Brisbane Racing Club and the Spirit Hotel group. You can also read about what is trending on functions menus and how the AITC is protecting the status of professional chefs. Our cover this issue features Mario Libertini of La Piazza, an authentically themed Italian dining precinct nestled within the environs of Bankstown Sports Club. We chat with Mario to discover how he has created such a successful establishment. In this edition, we also take a look at enhancing the standard breakfast menu and setting your burgers apart from the competition. You can also read about Nutella Heroes, contemporary presentation trends in cakes and pastries, and the 2018 Proud to be a Chef mentors. In this issue we take at special look at the process of super freezing at ultra low temperatures (ULT), a technological innovation that has revolutionised the seafood market. Get ready for the big news, ULT Yellowfin Tuna is now available on Australian shores. We also take a look at the growing demand for more contemporary seafood styles and pose the question ‘has from-scratch sauce had its day?’ In addition, you can read up on all the latest foodservice news and info regarding effortless baking, Proud to be a Chef, coffee and healthcare.